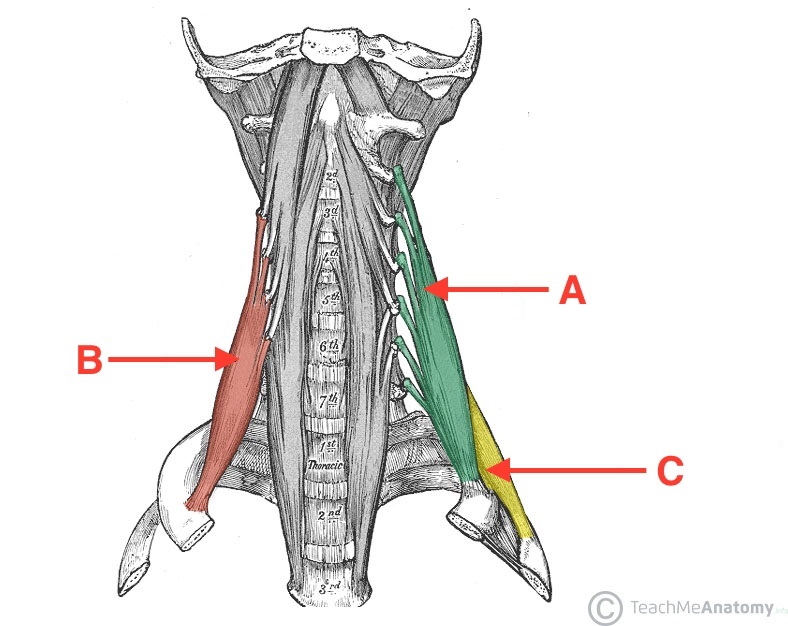 The scalene muscles are three paired muscles (anterior, middle and posterior), located in the lateral aspect of the neck. Collectively, they form part of the floor of the posterior triangle of the neck. The scalenes act as accessory muscles of respiration, and perform flexion at the neck. In this article, we shall look at the anatomy of the scalene muscles – their attachments, function, innervation and clinical importance. The anterior scalene muscle lies on the lateral aspect of the neck, deep to the prominent sternocleidomastoid muscle. Attachments: Originates from the anterior tubercles of the transverse processes of C3-C6, and attaches onto the scalene tubercle, on the inner border of the first rib. Function: Elevation of the first rib. Ipsilateral contraction causes ipsilateral lateral flexion of the neck, and bilateral contraction causes anterior flexion of the neck. Innervation: Anterior rami of C5-C6. The middle scalene is the largest and longest of the three scalene muscles. It has several long, thin muscles bellies arising from the cervical spine, which converge into one large belly that inserts into the first rib. Attachments: Originates from the posterior tubercles of the transverse processes of C2-C7, and attaches to the scalene tubercle of the first rib. Function: Elevation of the first rib. Ipsilateral contraction causes ipsilateral lateral flexion of the neck. Innervation: Anterior rami of C3-C8. The posterior scalene is the smallest and deepest of the scalene muscles. Unlike the anterior and middle scalene muscles, it inserts into the second rib. Attachments: Originates from the posterior tubercles of the transverse processes of C5-C7, and attaches into the second rib. Function: Elevation of the second rib, and ipsilateral lateral flexion of the neck. Innervation: Anterior rami of C6-C8. The scalene muscles are an important part of the anatomy of the neck, with several important structures located between and around them. The brachial plexus and subclavian artery pass between the anterior and middle scalene muscles. This provides an important anatomical landmark in anaesthetics for performing an interscalene block. The subclavian vein and phrenic nerve pass anteriorly to the anterior scalene – the subclavian vein courses horizontally across it, while the phrenic nerve runs vertically down the muscle. The subclavian artery is located posterior to the anterior scalene. Fig 2 – Proximal portion of the brachial plexus, in the neck. 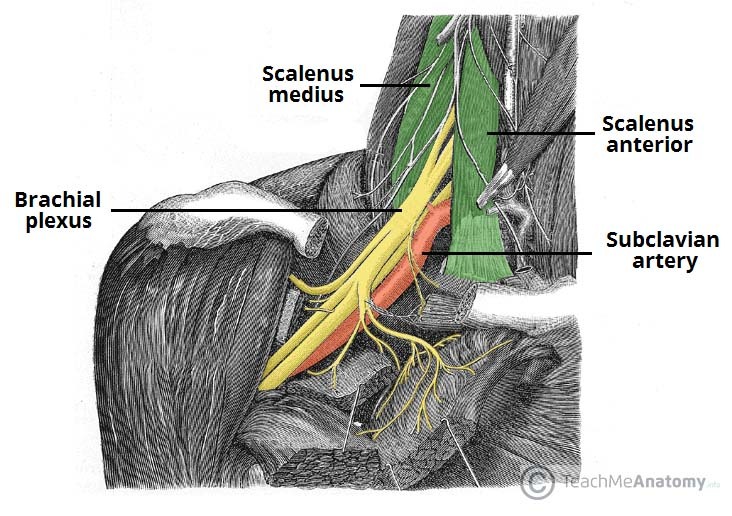 The brachial plexus courses between the bellies of the anterior scalene and middle scalene muscles. In upper limb surgery, the brachial plexus can be infiltrated with local anaesthetic to avoid the use of a general anaesthetic – known as an interscalene block. To do this, local anaesthetic is injected between these muscles at the level of the cricoid cartilage. The scalene muscles collectively act to elevate the first and second ribs, and in doing so they increase the intrathoracic volume. In patients with respiratory distress, the scalene muscles may be used as ‘accessory muscles of respiration’ to aid with breathing. By increasing intrathoracic volume, the patient can ventilate their lungs more effectively. However, they are not required in the respiration of a healthy individual, and so the use of accessory muscles is an important clinical sign of respiratory distress. Which structure is represented by ‘B’? Which muscle contracts to perform anterior flexion of the neck? Which structure is represented by ‘C’?